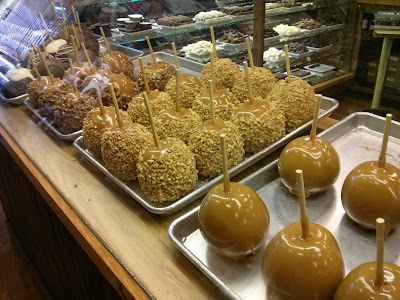 A few months ago, I saw a picture somewhere of an incredible looking toffee apple. It was smothered in caramel, drizzled in chocolate and dotted with M&Ms. And I could not. Stop. Thinking about it. I started googling obsessively, trying to see where I could get my hands on one. Alas, it seems to be something that is mainly an American thing. But, luckily, I was soon to be heading to Nashville! I was convinced that I would find one of these monstrous beauties, and make it my lover. And I did! Actually, it was one of the first things I saw when I stepped onto American soil, during my transfer in Charlotte. 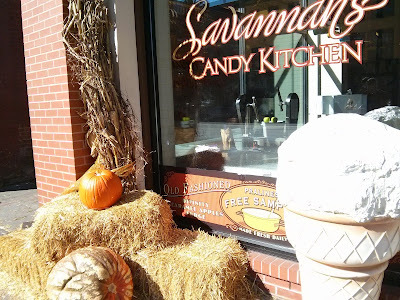 But I hedged my bets, and it was only on my last day in the city I popped into Savannah's Candy Kitchen on Broadway. I bought two, selfishly kept them for myself, and chipped away at them when I got home. And they were amazing. 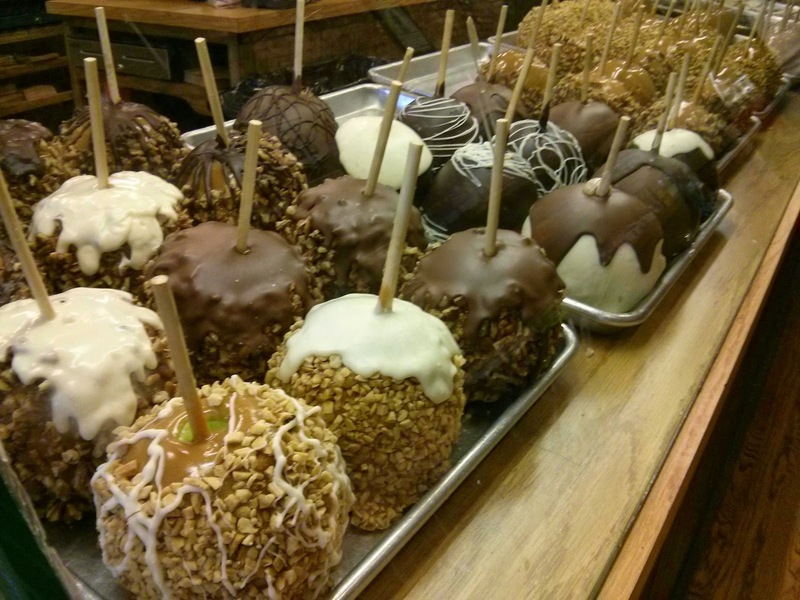 Traditionally, in the UK at least, toffee apples are made with rock hard crimson toffee, which takes your teeth out. I used to get them on the pier in Brighton, but they're so impossible to eat that the fun is kind of taken out of it. These are covered in a chewy toffee (and dubbed caramel apples), so life is made much easier. I decided that I had to make my own, to keep the beast satiated. And they're actually amazingly easy to make. 1. First off, pour boiling water over the apples, and give them a bit of a scrub to get the wax off. Why supermarkets wax the hell out of their fruit, I've no idea, but it keeps the caramel from sticking, so get it off. 2. Put your apples in the fridge for an hour or so. This chills them, so the toffee will cool and set faster. When you take them out, stick your sticks in, almost all the way through, but not quite. 4. Unwrap your toffees, sigh about the mountain of plastic mess you've just created, and melt in the microwave. It took two minutes to melt 300g, but do check on them after a minute. You'll probably need to do this in two batches, to keep the toffee nice and hot when you're coating the apples. I melted mine in a small pyrex jug, just a little larger than an apple, so it could splodge around all of the edges. You could also melt them over a bain marie. 5. This is the fun bit, but you have to work quickly. When you're dipping the apples, the toffee needs to be hot, as this is when it's fluid and easy to work with. When it starts to cool, it is reluctant to stick to the apples. Taking hold of the stick, dunk the apple in as far as you can go, turning to coat the top of the fruit as much as you can. This is kind of a learning curve - like pancakes, the first one will likely look a little dodgy. If it does, use a spoon to splodge some more toffee on top, but know that this won't give you the smooth effect you're looking for. I dunked my apples in a few batches - 2 or 3 at a time. After each batch I usually had to melt some more toffee, or reheat what I had. The toffee typically only stays warm for 2 apples, before you need to give it another 20 seconds in the microwave. 6. Mmmmm. Now, put the apples back in the fridge. You could leave them as is, but I wanted to get jazzy. If you too want to get jazzy, then melt your chocolate, the milk one first. Then, take the apples out of the fridge, and drizzle away. I wanted to get a properly drizzled effect, as I saw in Nashville, but I couldn't get it to work. It was only when I melted the white chocolate that everything became clear. So... don't worry about being too neat at this stage. Drizzle and dollop, and do be sure to lick the spoon. Frequently. 7. Now melt your white chocolate, and splodge on at various points over the milk chocolate. You're aiming for a marbled effect, like I showed you for the mars bar cake. So when it's on, use a fork to gently swirl the two chocolates together. I was taking these pictures at night, so the quality isn't fantastic, but you'll see what I mean. It wasn't exactly what I had in mind, but I think they're little beauties! Pop them back into the fridge, and you're good to go. I wrapped mine in cellophane, but I don't think there's any avoiding them sticking a little bit when you try to present them. So long as you remembered to oil the foil, they shouldn't stick when they come out of the fridge. They make very pretty presents, and you could even present them in a little box, for full ooohs and aahhhhs. To eat, take them out of the fridge for about an hour. I'm afraid you can't just pick up the stick and dive in, much as you will want to. These beasts are heavy! Slice around the centre, either side of the core, and then you're left with four uneven segments. Slice these up or just dive in as they are.